This Scotch 4" x 6" Photo Size Thermal Laminating Pouches preserve and protect documents you refer to or handle frequently. These 5 mil thick thermal laminating pouches are for use with thermal laminators. Pouches are clear to let important information show through with a professional finish. Get 20pk of Scotch 4" x 6" Photo Size Thermal Laminating Pouches. These pouches are very well constructed. I even use them as a carrier for our home fax system and they work perfectly fine for small size papers to fax. (Although they may not work on every fax machine) They especially are wonderful for our laminating machine. Comes in so handy for those pictures and such that you want to keep. Welcome to MyBinding video. 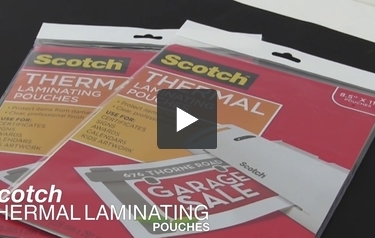 Let’s have a small look at the Thermal Laminating Pouches by Scotch. Scotch is a brand that we trust and for good reason. These laminating pouches are great for photos and heat sensitive documents that have special inks or drawings and the things like that. Protect what you need to protect. Simply place your document inside the pouch, close it up and the crease goes in first. The finished product is clear, see-through and protected. Scotch makes plenty of sizes for different applications. Let your creativity go wild. For more demos, reviews and how to’s, check out MyBinding.com.